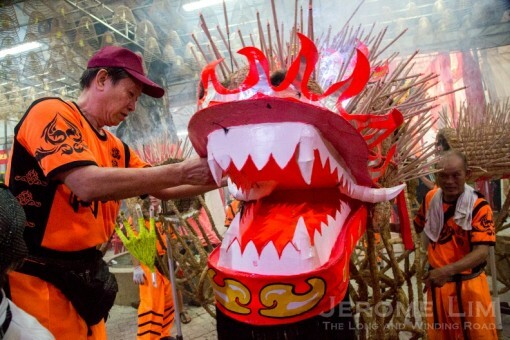 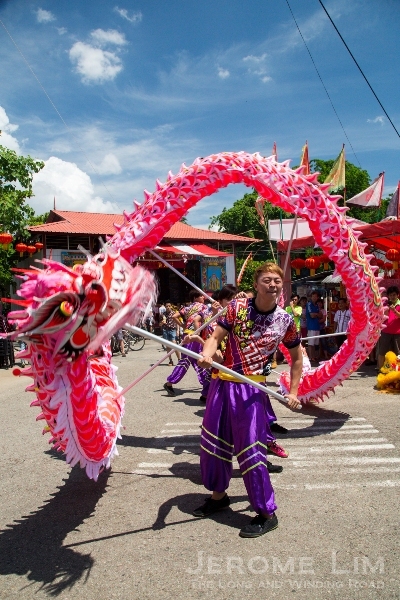 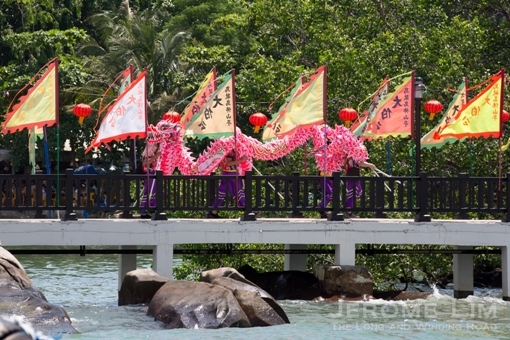 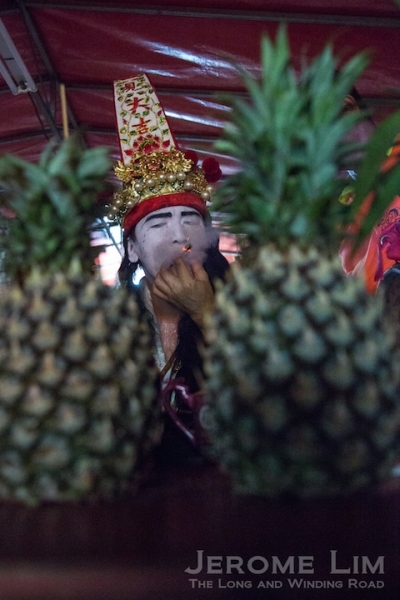 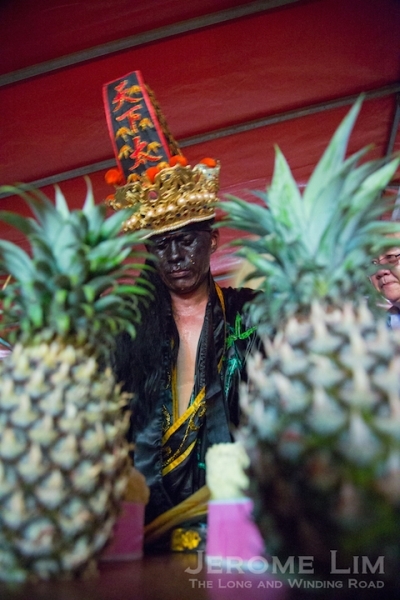 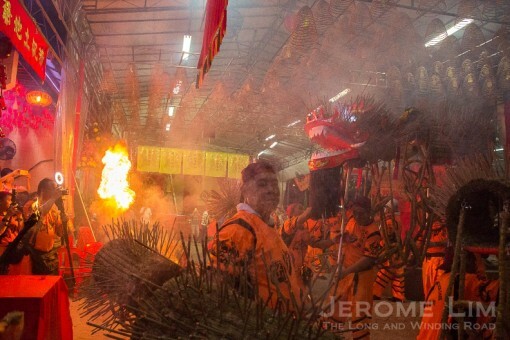 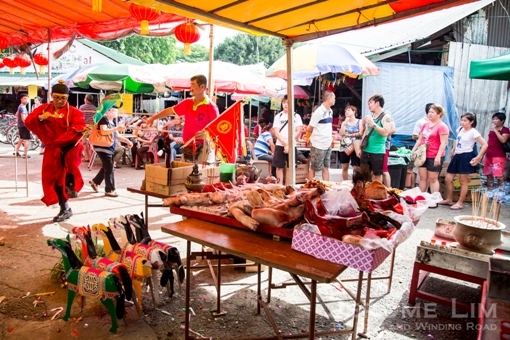 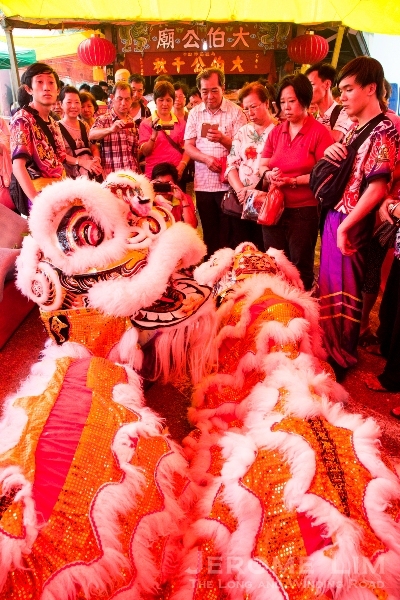 Every year around Vesak Day, Pulau Ubin comes alive as the Pulau Ubin Fo Shan Teng Tua Pek Kong Temple (乌敏岛佛山亭大伯公庙) holds a series of festivities to celebrate the Tua Pek Kong festival. 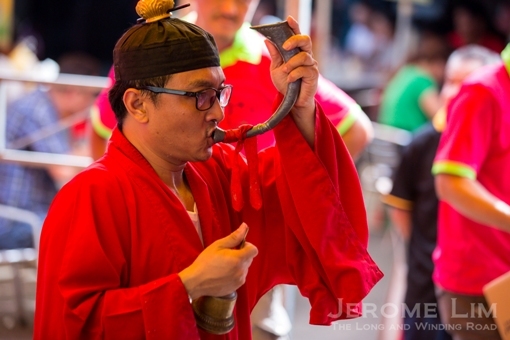 It is one of two occasions during which Teochew opera and getai performances are staged and offers a rare opportunity to watch Teochew opera as one might have done in the old days, under the stars. 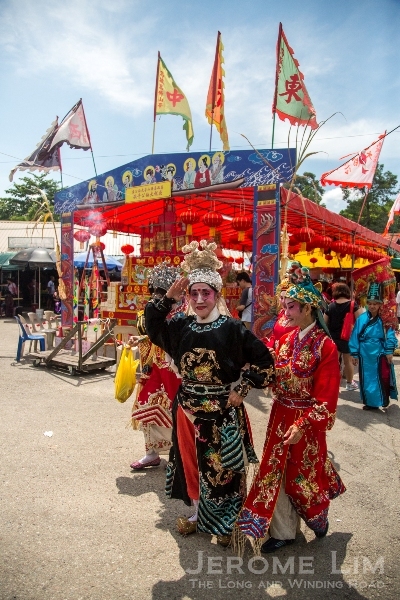 This year’s festival will be celebrated from 31 May to 5 Jun 2015 with opera performances every evening, except on the last when a getai performance will be held. 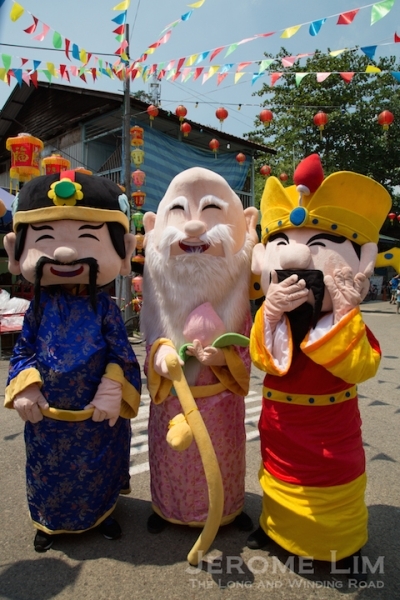 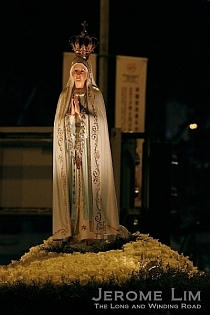 The main day of the festival is on 1 Jun. 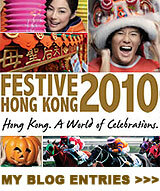 More information on the festival schedule is provided below. 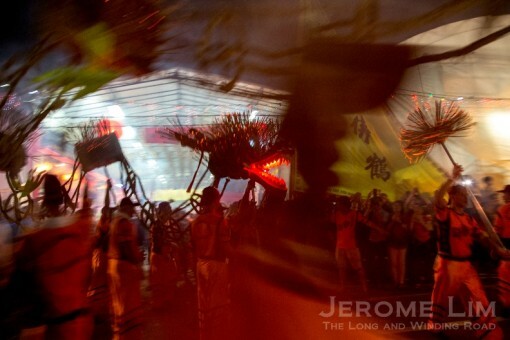 Backstage at the wayang stage during last year’s celebrations. 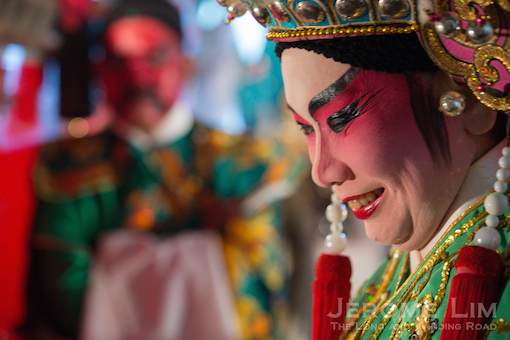 A brightly dressed dancer on stage during the last evening’s getai performance two festivals back. 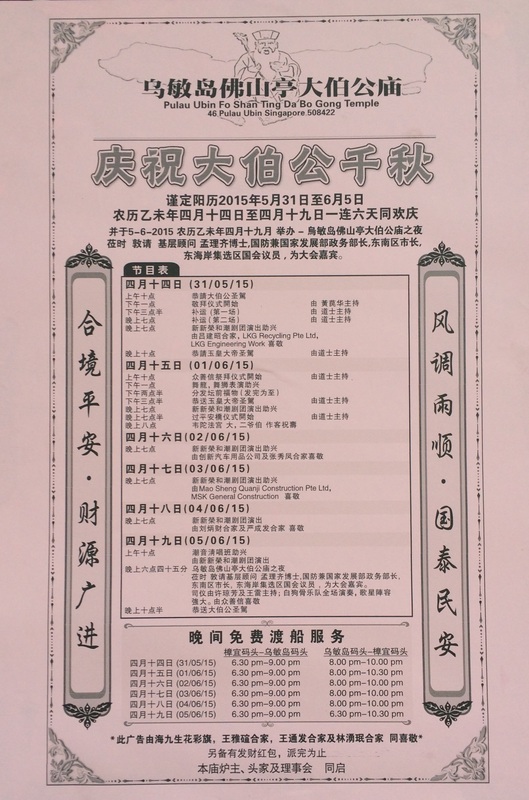 The schedule for this year’s Tua Pek Kong Festival. 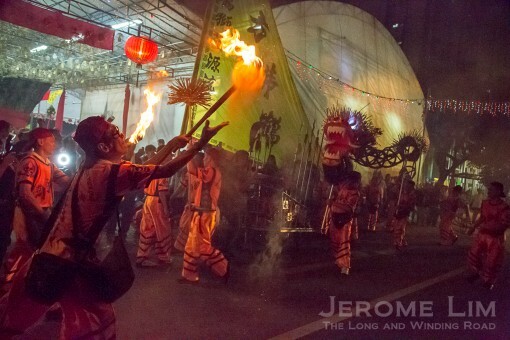 A view of the wayang stage during the evening’s performance. 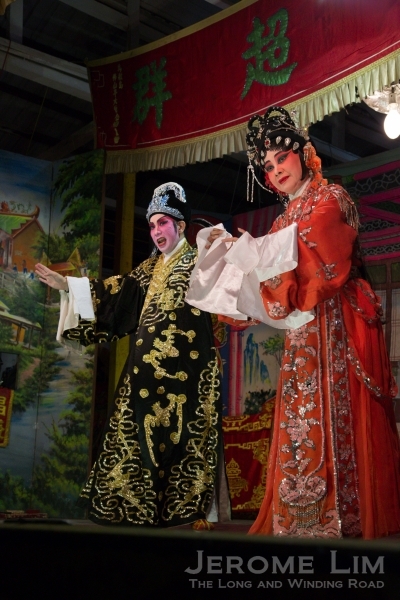 The Teochew Opera performances is one of the draws of the festival. 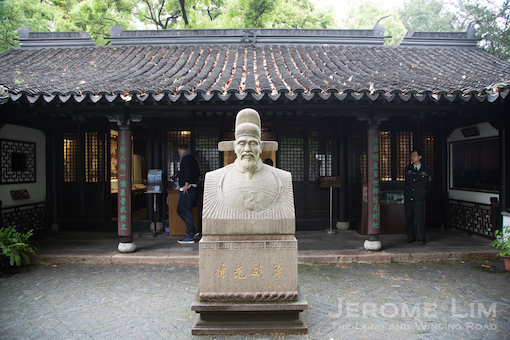 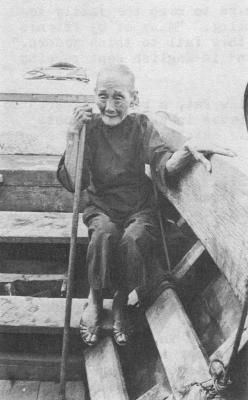 … the Li Ya Pek (二爷伯) or Hei Wuchang (黑无常). 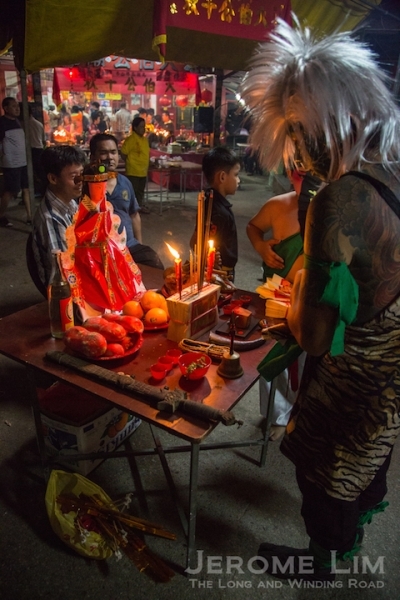 Collectively the pair – guardians of the Taoist interpretation of the hell or purgatory of afterlife, are known as the Tua Li Ya Pek (大二爷伯) or Heibai Wuchang (黑白无常). 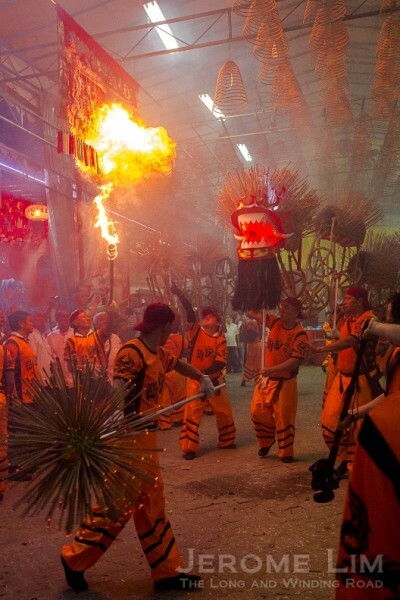 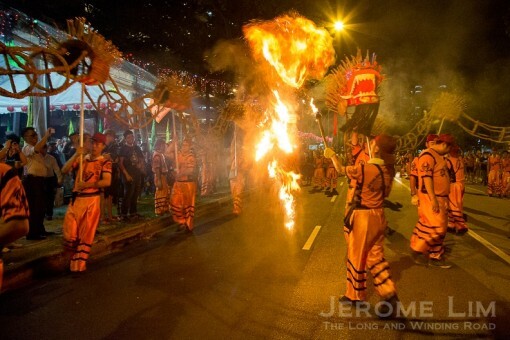 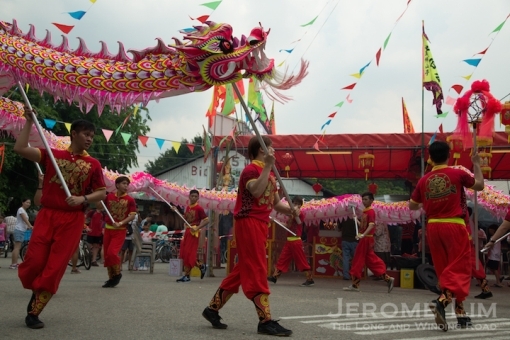 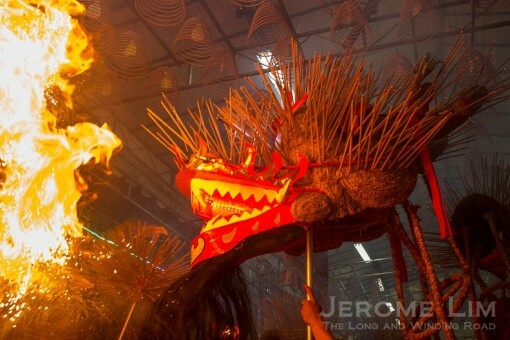 A dragon dance held during the celebrations. 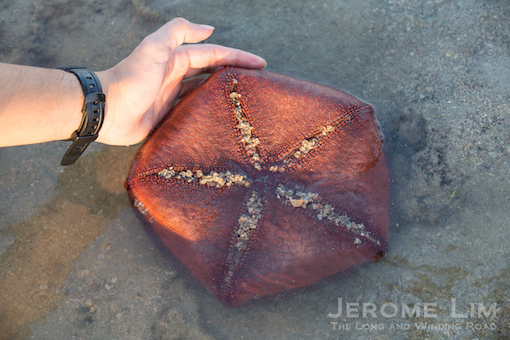 The three stars make an appearance. 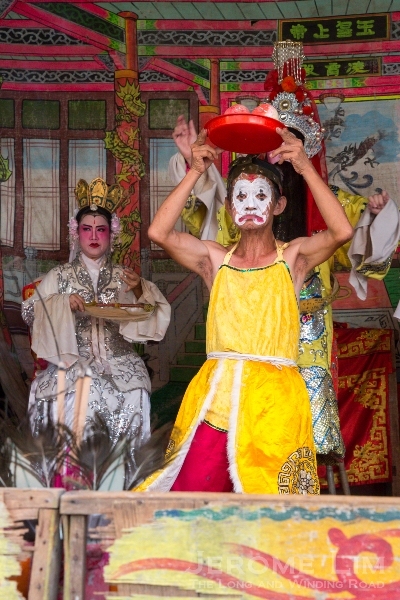 The opera troupe onstage paying respects to the deity. 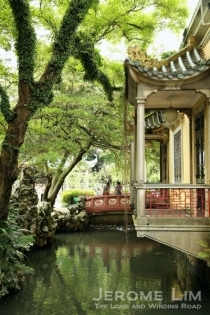 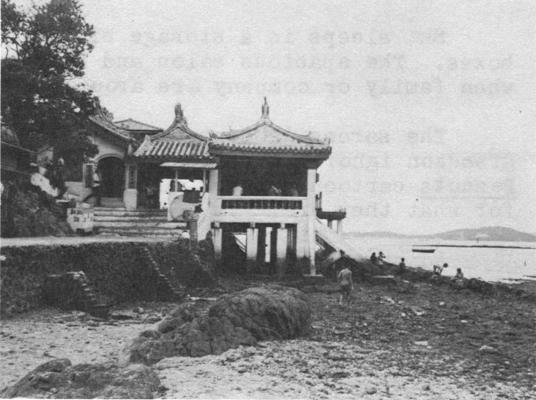 The Tua Pek Kong temple. 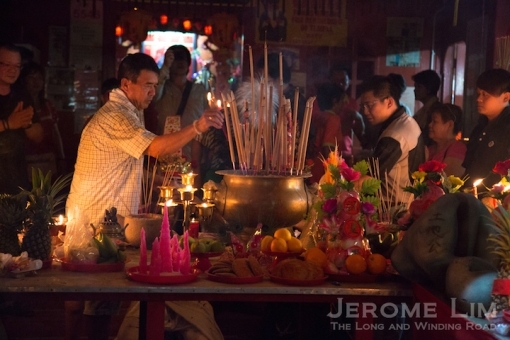 The temple during one of the rituals. 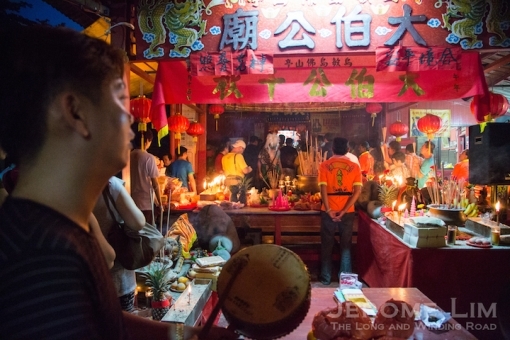 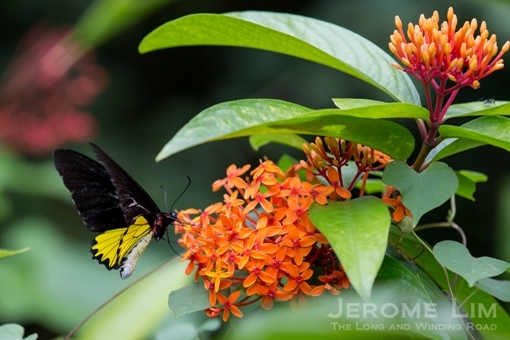 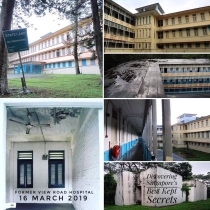 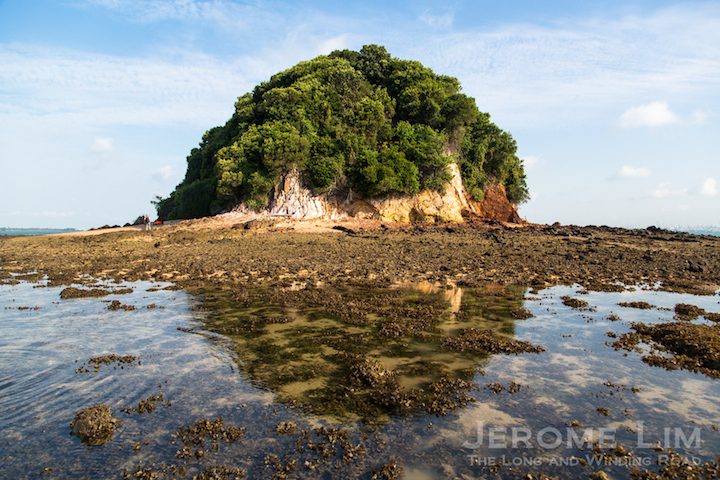 It is during two Taoist festivals celebrated in a big way by the Pulau Ubin Fo Shan Teng Tua Pek Kong Temple (乌敏岛佛山亭大伯公庙), the Tua Pek Kong festival celebrated around Vesak Day in May, and the Hungry Ghosts Festival during the seventh month of the Chinese lunar calendar, that the somewhat sleepy island takes on a festive air. 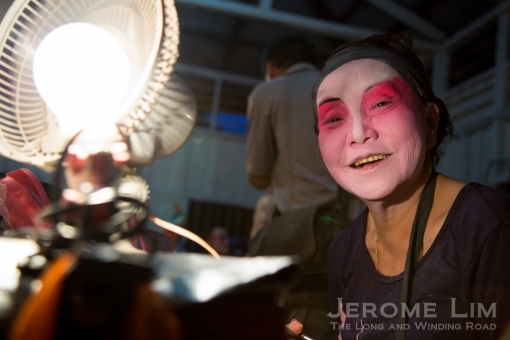 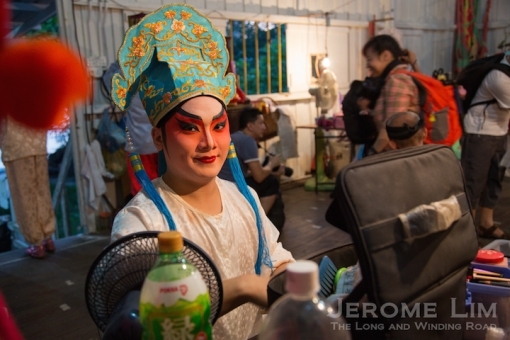 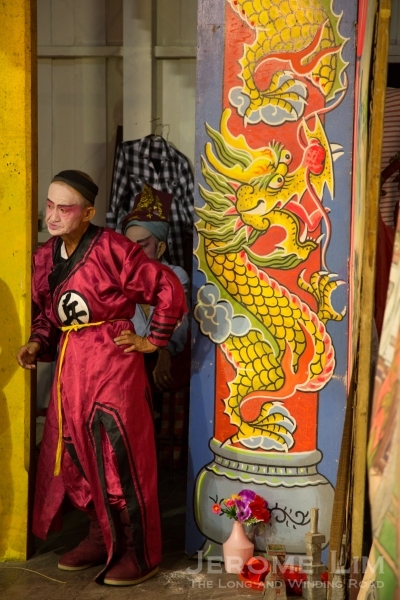 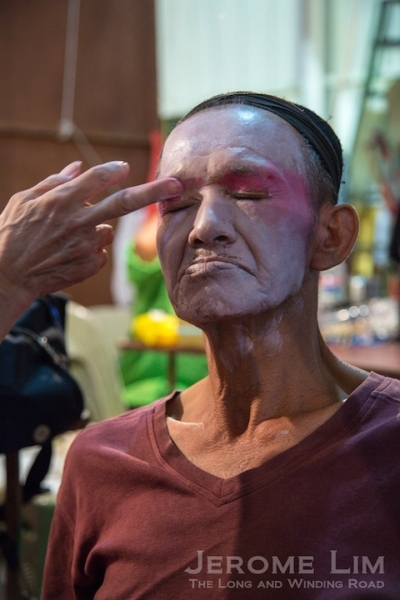 Backstage at the wayang stage: a festive face of Ubin. 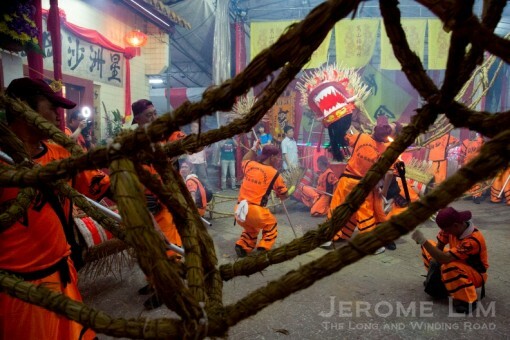 The island, particularly during the Tua Pek Kong festival, is overrun by thousands of visitors who range from the many devotees who go over to participate in the rituals at the temple and the curious who are there to soak up the atmosphere of what might once have been a common scene on the main island of Singapore; to the hundreds who would head there festival or not, to seek an escape from the madness of the concrete jungle. 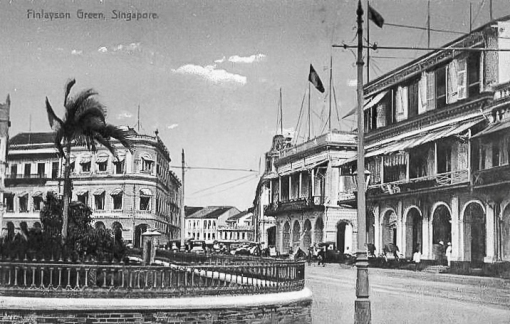 A modern interpretation of the three stars make an appearance. 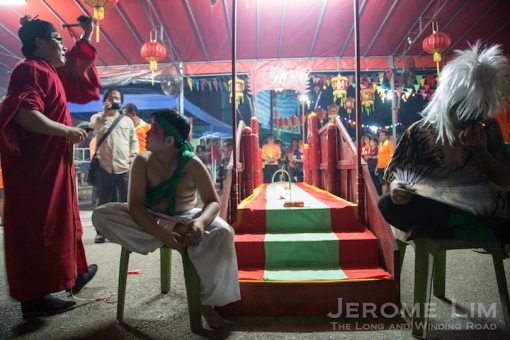 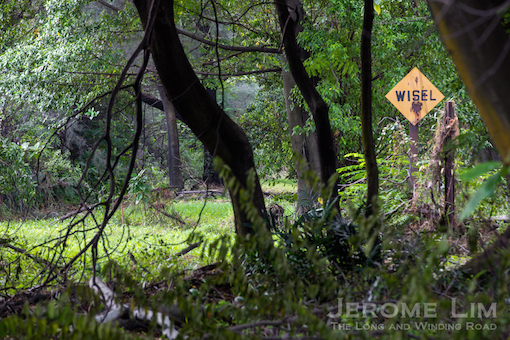 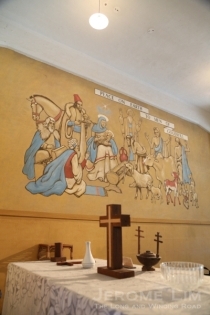 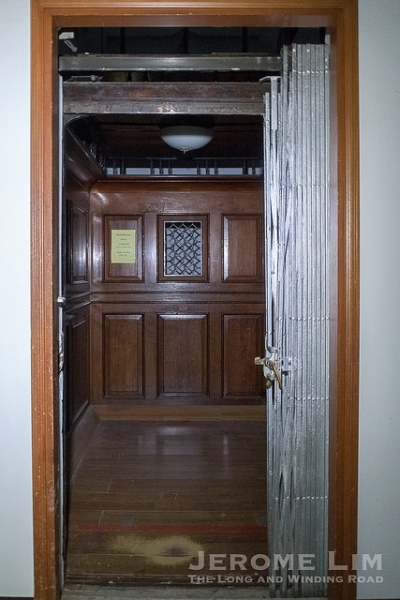 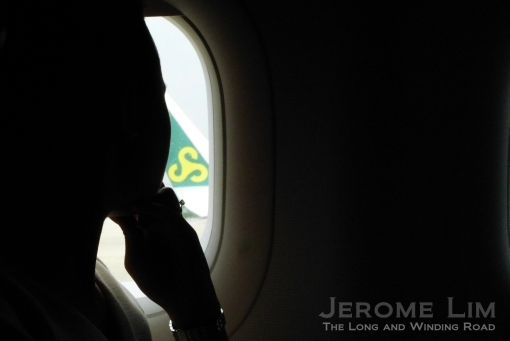 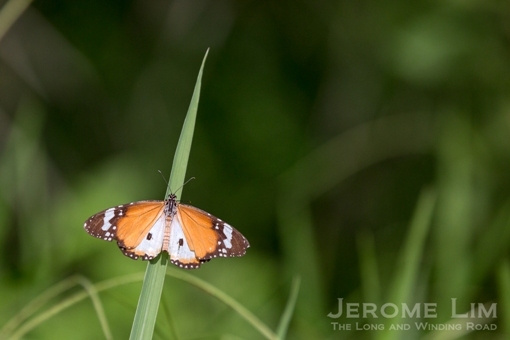 It is more than just the colourful religious rituals that would be of interest to the curious. 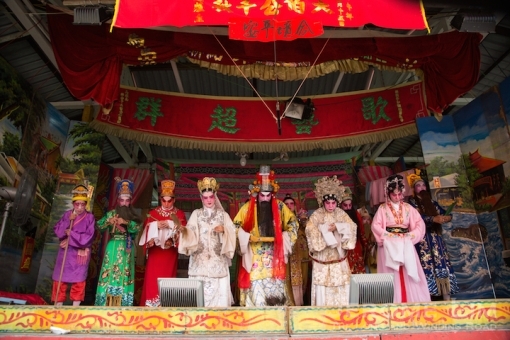 It is during the two festivals that we also see the use of the permanent Chinese opera stage – one of possibly two that are still left in Singapore. 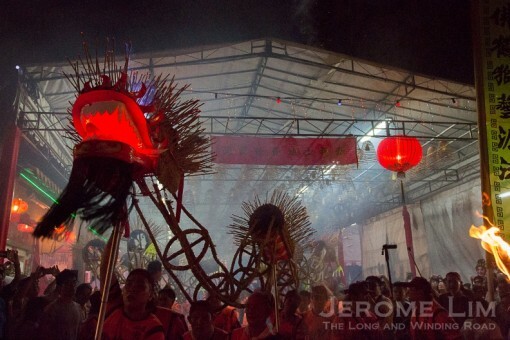 It has long been a tradition for Chinese temples to hold a ‘wayang‘, as the various forms of Chinese opera is commonly referred to in Singapore and Malaysia, in conjunction with festivities to entertain the deities and in the case of the seventh month, the spirits who return and many permanent stages were a feature of temples in villages across Singapore. 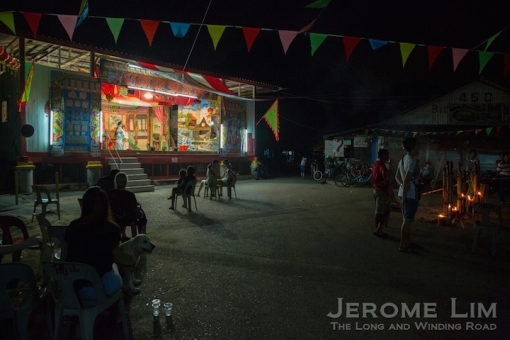 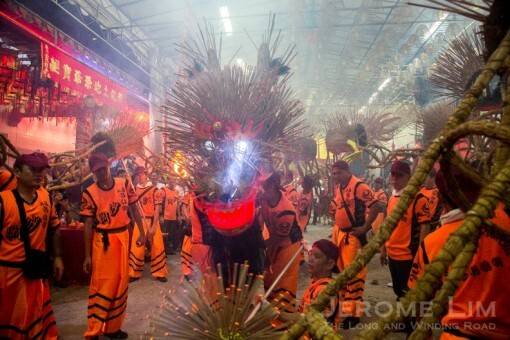 While interest in wayangs, which had a following among the masses, has waned in the wake of the introduction of more modern forms of entertainment, the art is being kept alive at the Ubin temple and by its Teochew opera troupe on which the spotlight does shine during the two big festivals that the temple celebrates. 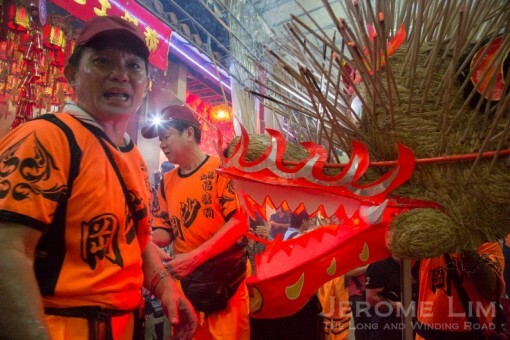 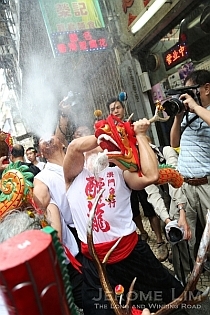 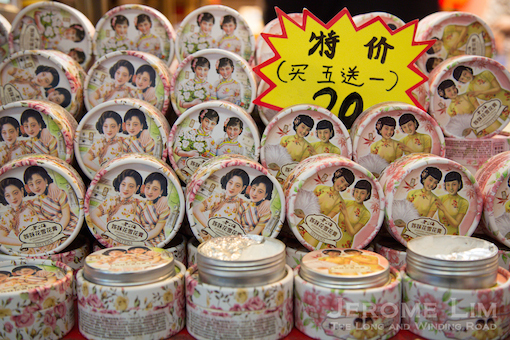 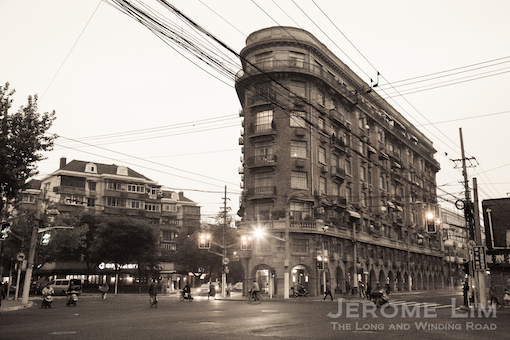 At the time of writing, this year’s Tua Pek Kong festival (the photographs of which are used in this post) is still being celebrated. 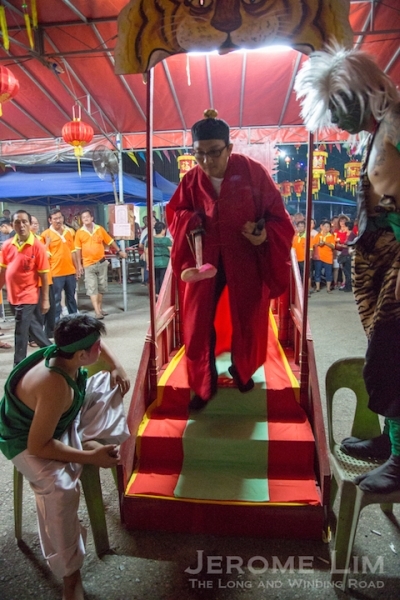 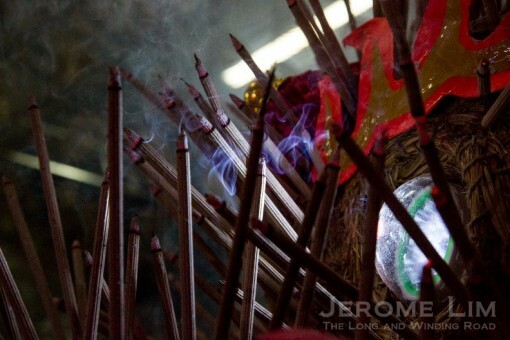 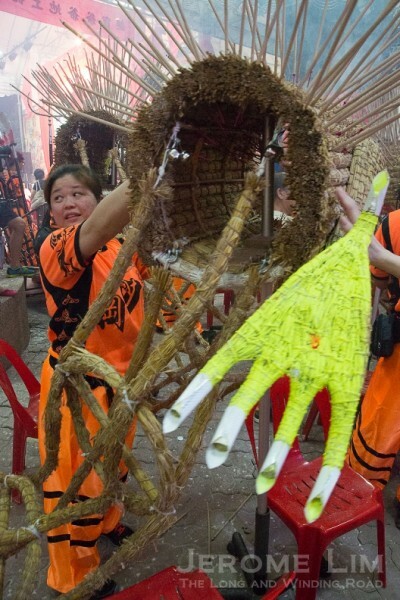 The celebrations will draw to a close on Saturday (17 May) with a getai (歌台) after which the temple sends Tua Pek Kong (Da Bo Gong or 大伯公) off. 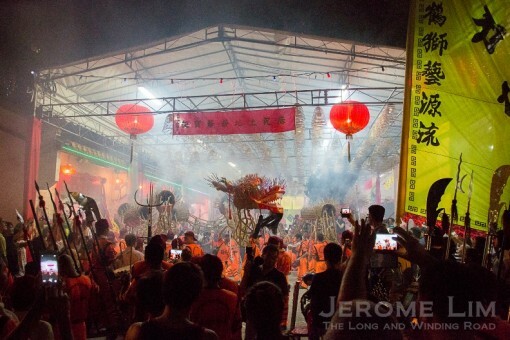 On the evidence of last year’s celebrations, the getai does also draw a sizeable crowd (see a post on last year’s Getai at Watching the stars under the stars) and for the experience of watching the stars (of the local getai circuit), under the stars, it certainly is well worth going over to Ubin on the final evening of the festival. 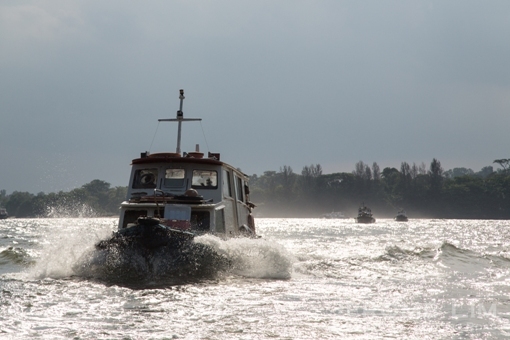 Free boat rides are provided through the period of the festival from 6.30 to 9.00 pm each evening from Changi Jetty (and from 8.30 to 10 pm on the return trip). 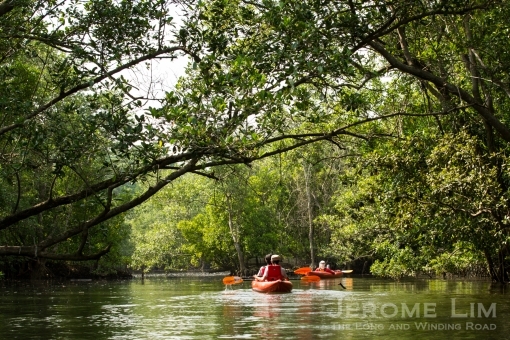 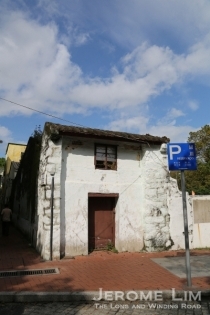 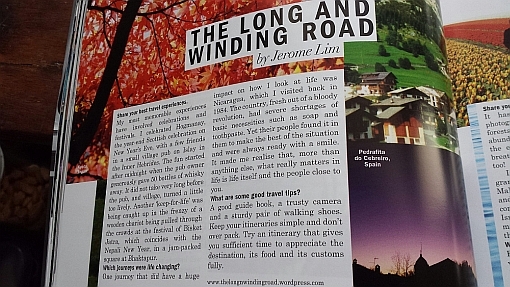 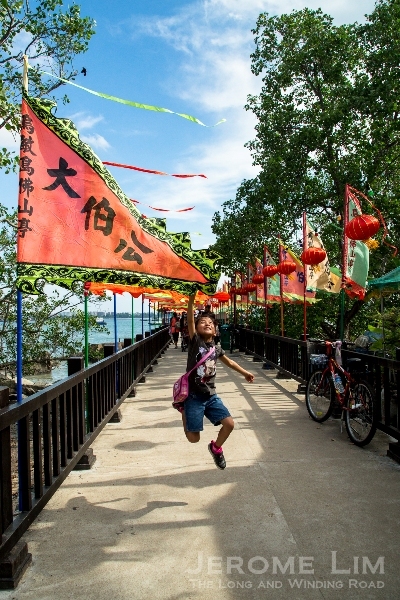 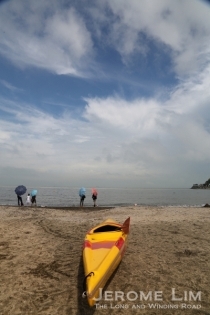 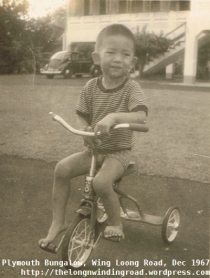 More information on the festival’s programme can be found at Peiyan’s blog: 12 May – 17 May 2014: Pulau Ubin Celebrates the Tua Pek Kong’s birthday.